�I�d urge anyone who wants to protect our coasts from an even worse oil spill than that which we saw in Tauranga, to sign this petition. By doing so, they�ll also be doing something positive about the climate crisis that this planet is facing." 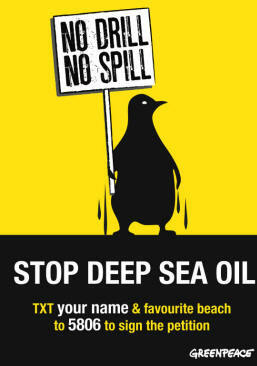 Just received the following from Lucy and it's a message to the NZ Government in regard to saying no to deep sea oil drilling.